Hello Everyone! I hope that you all are doing great. Again, I apologize for it being such a long about of time since I last posted. I'm hoping to do a short life update video for you all explaining a little bit about whats been going on. 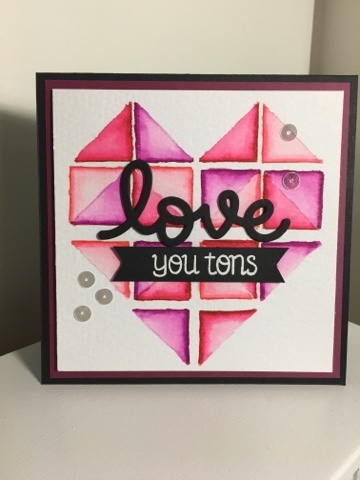 I honestly had all of these ideas floating through my head as to all these cards I was going to create in preparation for valentine's day.....I made 1! Just too little time in the day to get everything done. I sometimes wish us crafters had an extra hour in the day that was strictly for crafting. We can all dream can't we?! Onto the 1 card that I created for Valentine's Day, which is now just being referred to as a "love card", as it is WAY past V-day. I have had this geometric heart design in my head for quite some time now. 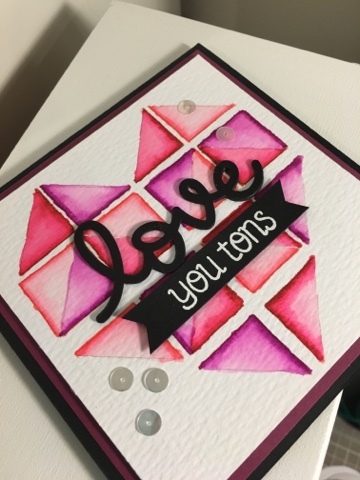 I remembered it from a challenge that I participated in when I was part of the Paper Smooches Sparks Challenge Team, you can find the original post here. And so, I was off to create something to put my mind at ease.